Digging The Dirt provokes questions about the world we're making for ourselves. A couple from a time past try to dig themselves a brighter future whilst a couple from time present face the repercussions of whistle-blowing. The impulse to make the world a better place comes up against the challenges inherent in working together. Rooted in both historical and contemporary events - the C17th Digger movement and the C21st leaking of state secrets - the twin stories twist around each other as the pressure builds. What do you give up in the name of freedom? How far do you compromise to protect your principles? 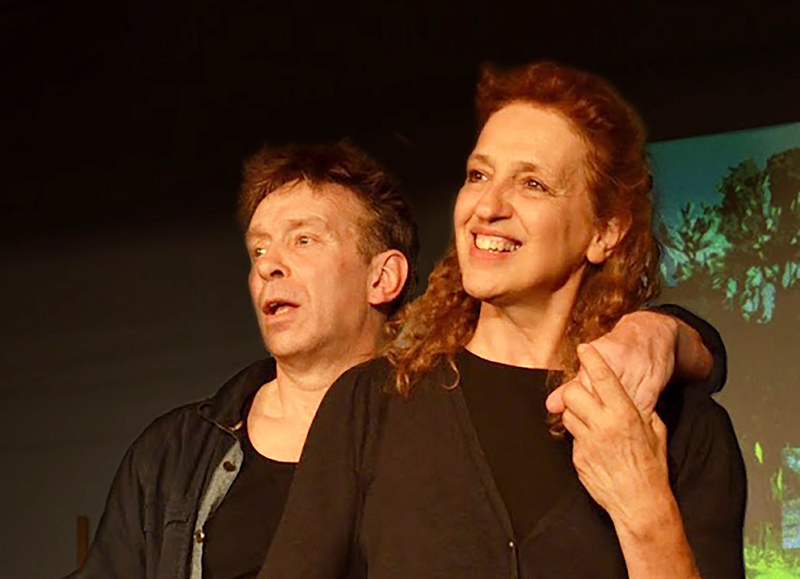 We have performed Digging The Dirt in studio theatres, fringe festivals, village halls, an historic Quaker Meeting House, a Socialist club, the drama faculty at the University of Wisconsin-Milwaukee and at Edgewood College, Madison USA. We are currently touring Quaker Meeting Houses throughout the UK. Some performances are already on our schedule, others will be added as they are confirmed. "Moved to tears by @multistoryTC. When do you speak out? And who listens if you do?" The Me Show was not what I expected. I had only seen the poster and a brief summary and I went in anticipating a show looking at social media, selfies and so forth. Instead, I discovered an incredible production that looks into political dissent and revolutionaries. There are three settings in The Me Show: the main action focusing on a couple who start a revolution by digging in a field. They begin alone but soon attract the attention of other like-minded families as well as a disgruntled landowner who wants to put a stop to their growing commune. Their story is interwoven with a monologue told over a Twitter feed of modern-day dissenters such as Edward Snowden, and the confession of a government whistle-blower currently in prison. The Me Show explores the mindset of those who choose to follow a moral code or ideology with full awareness that it will only bring them ruin. It is a fascinating insight into modern-day whiste-blowers or political dissenters who speak out against their government or country knowing it means prison, exile or death. Although it is a commentary on modern society, it is hard to pinpoint The Me Show at any period in time. The characters use outdated slang and refer to figures such as ‘the squire’, but at the same time they refer to modern day technology. It ends up closer in style to a fairytale than to political satire. Multi Story should be commended for their willingness to pull apart characters and themes where most other shows would not. Halfway through the production, you begin to question whether the revolutionaries are creating a more free society, or whether they have just found a new way to limit and control people. Both actors give fantastic performances. Bill Buffery’s ornate and lavish physicality fits perfectly into the fairytale atmosphere. However, Gill Nathanson’s lead performance is incredible as she switches between the hero and villain of the play effortlessly. Multi Story Theatre have created an incredibly intelligent and clever political satire in The Me Show, whose power gradually overcomes the audience as the play progresses. Two differing narratives in one show. The first follows the story of a couple in the aftermath of a war as they start digging on a hill trying to make a better life for themselves and those who decide to follow them. The second showed a woman who had exposed government secrets when she decided her loyalty to her country was more than that to her employer. Both showed people standing up for what they believed was the greater good, refusing to let the person with all the power decide their destiny. Bill Buffery and Gill Nathanson were faultless in this production. They both played multiple characters which they slipped between with ease - each with clear distinctions. There wasn't a huge amount of movement so the plot focused very much on the text but they were both engaging and a pleasure to watch. There was a good turn out for the performance but the play was quite a deep thinking one and there was an almost eerie silence in the room when it finished. It was clear the show had made people consider the issues it confronted. The little bits of physical theatre which took the story from one scene to another. 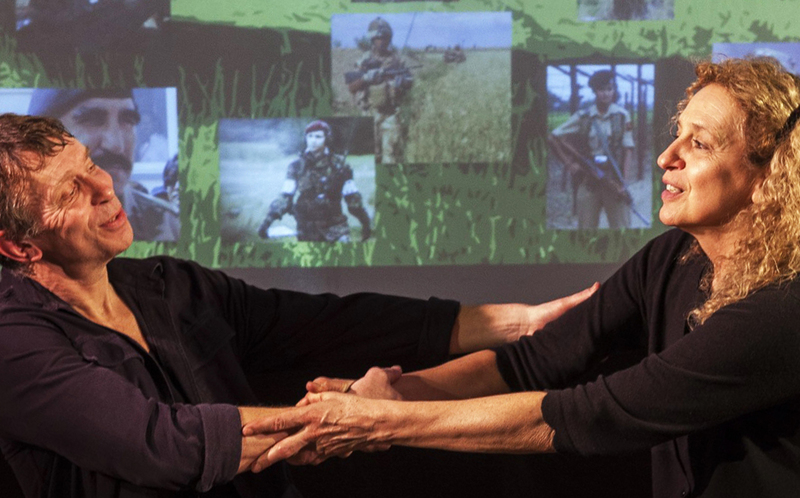 The two actors lifted each other, rolled over each other and caught each other as the two narratives began separately but ended in the same place. The Me Show in the Everyman Studio is not that different from Of Mice and Men which is playing in the main house. Both have strong socialist principals, both are about striving to attain a dream and both involve a certain amount of digging. The difference is that the Steinbeck piece is a fully fledged, dramatically sound piece of theatre, a real play, whereas MultiStory Theatre’s offering is more cerebral, more in your face with its ideas and ideals. This is the dilemma with “political” theatre – do you enclose your message, your beliefs, your quest for a better, a fairer society in a drama with lots of clearly defined characters playing out a situation from which, hopefully, your message becomes clear or do you stand down stage centre and sock it to your audience between the eyes? The Me Show is somewhere in between. Of Mice and Men is a play with solid socialist credentials, yet the dream central to the story is the ownership, by the two leading characters, of a small plot of land – the fruits of which they can live off. 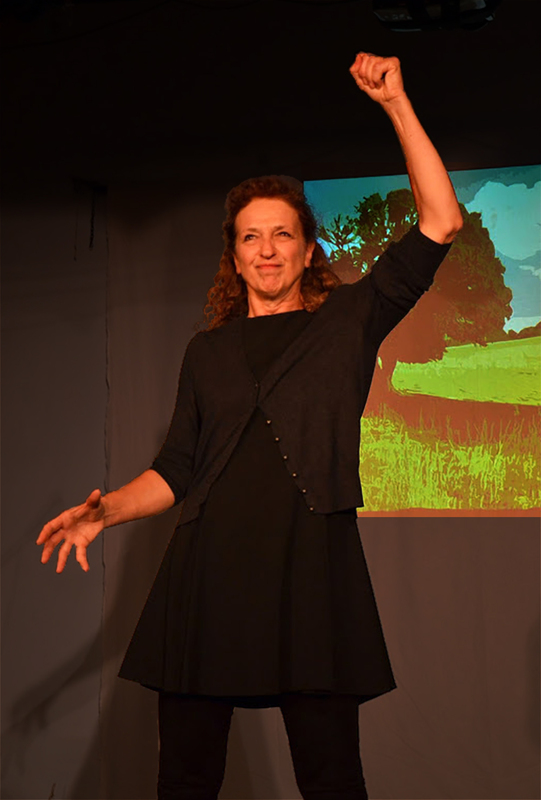 The Me Show, on the other hand, starts with a woman in an English village digging up the local common for the benefit of the community, land which she believes has been appropriated over time by the villains of the piece, the local squires. All well and good, but during the play convincing arguments are made by the squire and by other villagers about why the scheme won’t work. It demonstrates that socialism is alright in theory and that while the mantra of ‘from each according to his ability, to each according to his needs’, is hard to argue with, it flows contrary to human nature and will always fail. I was not sure on which side of the fence MultiStory was situated or whether they were perched on the top. The arguments they made for the end to ownership of land and for the redistribution of wealth were ably and persuasively challenged by other characters portrayed in the piece and the very fundamentals of socialism were confronted so well that it was difficult to know exactly where the writers stood. This is not a criticism, on the contrary, it is good to see the case put forward without the dogma usually attached to it. This was as much a forum for discussion as a manifesto. And Bill Buffery and Gill Nathanson, who are MultiStory, put on a good show. They are two very accomplished and confident actors who obviously know what they think, know what they want to say and know how to say it. Their plays are well thought out, well performed and, most importantly, balanced – there is nothing worse than a rant on stage purporting to be a play. The main story is about a woman wanting to use the village common land for the common good, but interwoven is a thread of another, a government (GCHQ?) whistle-blower, whose beliefs land her in hot water. It’s all about standing up for what you believe in. Both women do what they believe in but do either make any difference to anyone else’s lives apart from their own? No, is the answer. Is sacrificing yourself for your beliefs and the common good effective or worthwhile? That is a decision few us will have to make. Was there ever a fair society, can we ever have a better, brave new world? I doubt it, not when there are people in it. "The play left us all with much food for thought and having had a great hour of entertainment. It provoked a lot of discussion over a later meal. " "@multistoryTC The Me Show is a wonderful, thought-provoking, earthy piece of theatre that we highly recommend!" "Moved to tears by @multistoryTC 's The Me Show this evening @BarbicanTheatre. When do you speak out? And who listens if you do?" "Woke up still thinking about #TheMeShow such a strong first showing and much needed message @multistoryTC"
This 5-star rated, award-winning production is a moving mix of fairy-tale and political commentary. Digging the Dirt weaves together two stories: a couple from a time past attempt to dig themselves a brighter future whilst a couple from time present face the repercussions of whistle-blowing. Making the world a better place comes face to face with the challenges of working together. Rooted in actual events, Digging the Dirt is a fable, though accompanying images reinforce the connection with our contemporary world. "Moved to tears by @multistoryTC this evening. When do you speak out? And who listens if you do?"